Like a real jerk, I missed my own blog’s fourth anniversary! During the month of June, we were living with my in-laws, as we were waiting for our next apartment to open up. Towards the end of the month, we were told that the apartment wasn’t going to be ready until the second week of July. It was a real mess but now we are settled in. I have been anticipating making the anniversary post, and had plans to prep it early. I knew with WordPress’ new Stats page, it was going to be harder to gather the stats like I’ve been accustomed to in the past years. So I really should have started this much earlier. Instead, we were watching Chopped, a show we are quickly becoming addicted too after falling in love with Chopped Jr. One of the chefs on proper Chopped (Chopped Sr.?) discussed how he had plans on moving to Trinidad. This is during Season 27, we may work our way backwards on the show, sort of like how we did with Master Chef. Wherein we start with the previous season, see if we like it and work our way backwards. That was the plan until we got to Chopped Redemption, now we might start it properly at Season 24, as that is what Hulu has for Chopped. Earlier in Season 27, another chef had just come back from Trinidad, so Trinidad has been on my mind as of late. Earlier in June, I looked at our stats of countries and noticed Trinidad was sitting at nine visitors from that country to this blog. So all of a sudden, I remembered why I had looked up that stat. Now we have had 48 visitors from Trinidad & Tobago. Which is tied with Slovakia. Since I don’t have access to my comics, I knew I wasn’t going to be able to review a fourth Annual, which is lousy. So that was another reason for my hesitation. I still wanted to do this post though as it is amazing I’ve been doing this for four years now. Not as impressive that it isn’t a daily blog but I’ve been enjoying the Monday, Wednesday and Friday new routine. Now that I’ve started just doing more general posts (I still have some comic posts drafted) I’ve gotten a slew of other posts being drafted. I really have been missing writing. I just wanted to write something regarding this, in case that someone clicks on the S&FwM tag, they see that this post was delayed and I completely missed my June 30th deadline. Usually I’m way ahead of this. I really should have it memorized that my wife’s birthday is on the 25th of June and so, after that, I really need to get the blog’s birthday under wraps. Now we are settled in our new apartment, I can concentrate on this post – like an adult. My apologies for the long delay, I’m recommitting to the blog. Our hopes is to be at this apartment for the year’s lease and then be ready for our first home. Which is super exciting for us – as we officially embark on that, I’m sure I’ll have thoughts on real estate as I start really researching that. We met with a really wonderful Mortgage Loan Originator, so that was the first step onto that path. I finally got the job I needed to be set for a home purchase, and one day, “down the road” will be just around the corner. We’re still taking over the world! I was showing Walker Dennis the map and he was quick to point to that strip of Africa that I haven’t been able to touch yet. If anyone knows anyone in that part of the world, please recommend this blog to them! 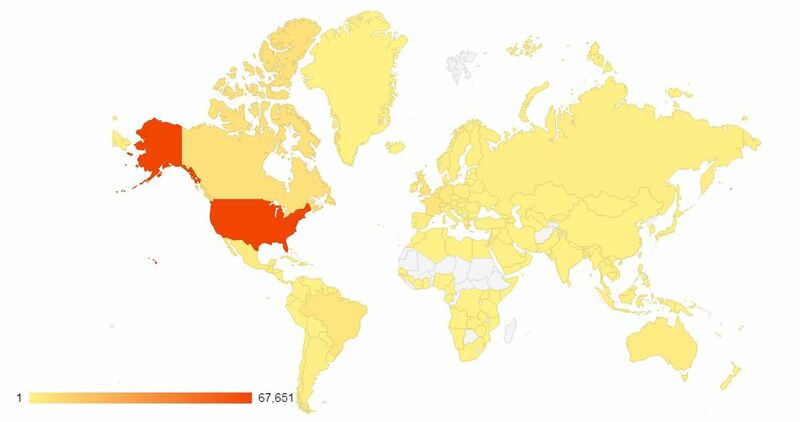 I need to figure out which countries those are and see what interests them. Those countries are : Western Sahara, Mauritania, Mali, Burkina Faso, Niger, Chad, Central African Republic, Sudan, South Sudan and Ethiopia. I’ve heard of some of those, mostly the last five listed there. Let’s see how many stats I can recreate from the previous list. My problem is that WordPress did away with the “All Time” stats page, which seems silly to me, why go : Days, Weeks, Months and Years and not have “All Time” as well? So, if I have the numbers, I’ll do the math to try to get as close as possible. At 1,958 views – our most popular post has been: Bounce Patrol, so I really should check up on those nice people! Walker Dennis has outgrown them, I’m sad to report. Maybe he would get back with them, if I reintroduced it. I heard that they finished the alphabet and released a FAQ type of video – which I should just watch on my own. At 99 views – our most popular comic review has been; Death of Wolverine 3, just one more to break 1,000! I’m still a tad obsess with getting my visitors from countries with nine views to ten views so if you know anyone in Moldova or Laos, or can go there and visit this site there, please let them know that they are welcome back! The only stat I couldn’t recreate is Best Ever Single Day, it probably is still July 24, 2014 at 275 but I would love to be able to verify that. I had to do my own math on followers, and had to go to the individual websites to get the numbers. I had to recreate my Instagram page, which killed all of my enthusiasm for that site, so I haven’t updated or done anything with it. I also had to do the math for the All Time Views and Comments but doing that math was pretty easy. Hey, look, a Tuesday post! Just to further highlight my embarrassment! For the record, regarding Big Brother 19, I’ve seen live feeds but no episodes so no threat of covering that show this year. My wife is just so far ahead of me. If I could get a Kindle or a working tablet (don’t buy a trio tablet, their customer service is not that great and very rude! ), I could at least watch more shows. My wife did point out that I should use the laptop more often to watch shows, I use to say the volume wasn’t great on it but since I’ve been listening to podcasts with earplugs, I should be able to do the same thing with the laptop. It is all about creating a new habit. I just need to start that process. Seriously though, thank you all, again for visiting the blog when you do and can. I know it isn’t quite the same as it has been in previous years. Losing my comics outlet wasn’t great and money is tight so buying online isn’t really an option either. Maybe next year, things will be different. That’s become our motto at Klein Manor but 2018 should be an amazing year. Our van will be paid off and without that loan, we should be able to get ahead on several other bills. It has been a long three years but we’re finally doing it.